The Full-Fat Solution is your modern-day guide for selecting healthful "full" fats for your entire family. Long gone are the days of "low-fat" yogurt, dairy, salads, snacks, and dinners. Fat is essential, and healthful fats are a must for reaching your optimal health. Healthful fats found in leafy green vegetables, nuts and seeds, Greek yogurt, cold-water fish, and expeller-pressed oils can easily be incorporated into your family's diet. Extensive scientific research has validated the benefits of healthful fats for glowing skin, shiny hair, strong nails, flexible joints, balanced hormones, a lean body, a healthy heart, and smart children. 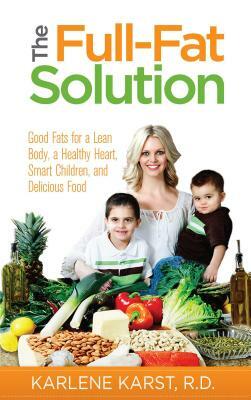 Let Karlene Karst, R.D., author, and mother, teach you how to select and cook with the best fats, and about the science of what they are doing for your body. Within four weeks of incorporating healthful fats into each of your meals and snacks, the benefits to your health will shine from within. Author Name: Karst, Karlene, R.D.